The Z1R Nomad classic helmet continues to offer both supreme fit and paramount safety while offering a dynamic style. The Nomad offers the freedom of the open road with the necessary protection. The Nomad is DOT approved and is designed to sit down on your head, not on top like so many other mushroom top 1/2 helmets. Unlike others, the Nomad's removable neck curtain provides extra coverage and includes pockets for the rider's communication system. With versatile looks and one of a kind fit, the Nomad sets the standard for classic styling and modern performance. Would recommend this helmet highly for style, quality graphics and interior quality materials. Comfortable. Great helmet for the price. Very nice looking helmet with the flame design (in my opinion) The helmet ran a little large, as I usually take an XL, and this one was a little loose (maybe should have gone with a L), but it's not enough to complain about or send back, The inside padding is very comfortable and the airflow is good as well, I like the helmet, and recommend it. The helmet looks better in my hands than in the photo. This helmet looks and fits great. I received my order in 3 days. Thats faster than anyone else. Iwill be doing more business with your company. Looking for a helmet that's cooler for hot summer days. Read good reviews on this one plus like the style of being a bit more than a half helmet. The wifey likes an open-faced helmet, this one matched the bike well. i have a matching one for a passenger. Just bought our 2nd Harley and needed a pair of helmets to match the color of our new Heritage Softail. the flames matched my bike. Because I would love to find an open face helmet that fits, is cool, and comfortable, and does not make me look like a mushroom. We will see! 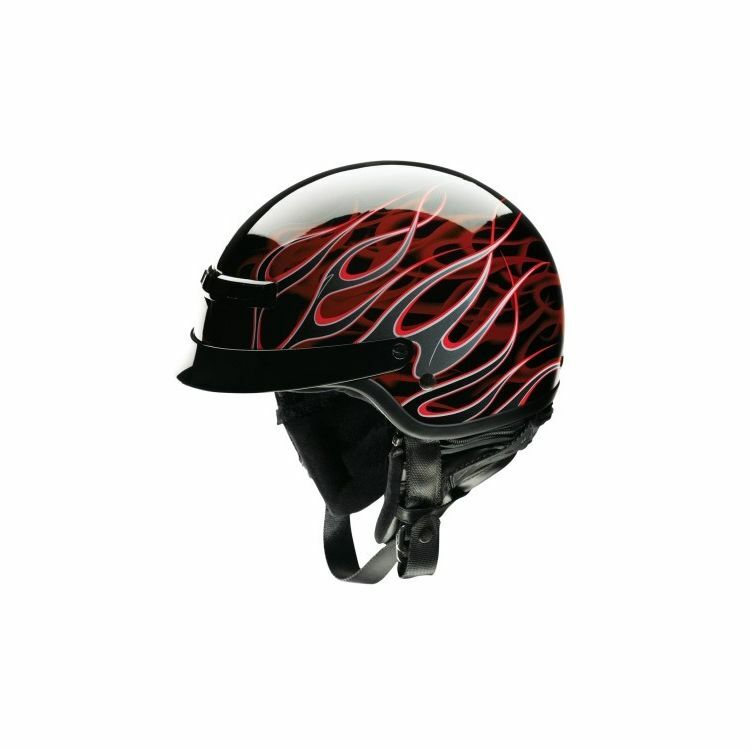 Have a fantastic Arai full face but need something for the really hot days. Could I put a face shield on this helmet? BEST ANSWER: No. There are no snap connectors. The visor is connected by a small single fastener on each side. No, they are not designed for a face shield. can you change the visor to a longer one? Can you put a head set in it?